Three works each 40H x 27w x 2D inches. SHAKTI TRIPTYCH, Rajas, 2013. 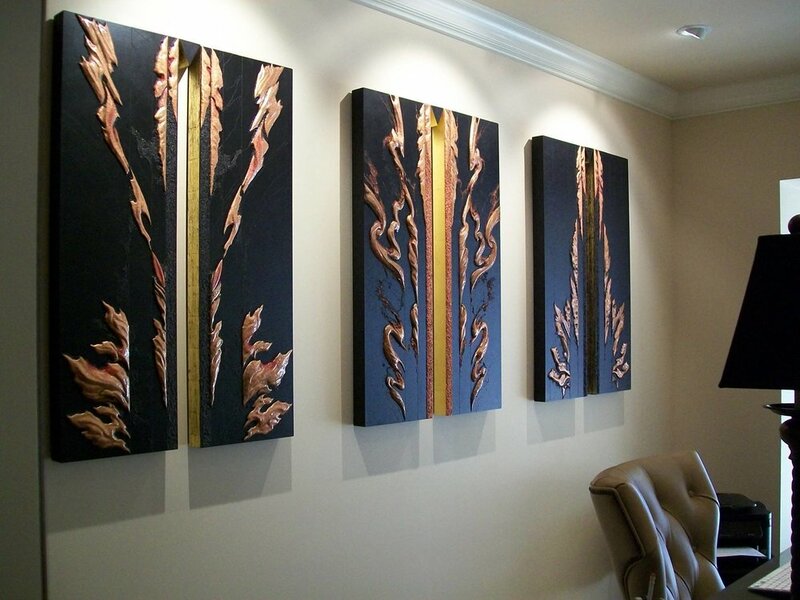 Left image, copper repoussé elements, mineral particles and threads and 23K on archival wood panel. Collection of JoAnn and Robert D. Huth. SHAKTI TRIPTYCH, Sattva, 2013. Central image, copper repoussé elements, mineral particles and threads and 23K on archival wood panel. SHAKTI TRIPTYCH, Tamas, 2013. Right image, copper repoussé elements, mineral particles and threads and 23K on archival wood panel. BURNING WORLD 3, 2015, 16 x .75 inches, copper repoussé elements, mineral particles and threads, platinum and acrylic on archival wood panel. BURNING WORLD 2, 2010, copper repoussé elements, mineral particles and threads, acrylic on archival wood panel, 20 diameter x .75 inches. Collection of Shelley and Donald Rubin. BURNING WORLD 1, 2010, copper repoussé elements, mineral particles and threads, acrylic on archival wood panel, 20 diameter x .75 inches. Collection of Berthe and John G. Ford. YARA DIPTYCH, Yara 1, 2010, copper repoussé elements, mineral particles and acrylic on archival wood panel, 70H x 23.5W x 2D inches. YARA DIPTYCH, Yara 2, 2010, copper repoussé elements, mineral particles and acrylic on archival wood panel, 70H x 23.5W x 2D inches. INNER PERCEIVER 1, 2011, abraded acrylic and 23K gold on archival wood panel, 36 x 36 x 2D inches. Collection of the Artist. BLUE PERCEIVER, 2011, abraded acrylic and 23K gold on archival wood panel. Private Collection. The AKEDAH TRIPTYCH installation at The Gallery at Penn College of Technology, 2008. Three images, Isaac, Jesus, and Ishmael, each at 48 x 48 x 2D inches, acrylic with mineral particle threads on archival wood panels. Click on the images for paintings and details.